Spring is just the best time of year to create a beautiful tablescape. Decorating for spring and/or Easter couldn’t be easier with the following photos of beautiful tablescapes as well as a few single decor items to inspire your creativity! I grouped these tablescapes together for you by theme: Floral, Eggs, and Bunnies. You can also go through these photos and look for specific color themes: Pinks, Greens, Yellows, Blues, and Lavender/Lilac. Whether you’ve only got a few hours or you’ve got all day, there’s something here to inspire you and put them together yourself. Doing it ourselves also saves some money, which is always a plus! So let’s get started with the . . . This look just sings spring with the soft pinks and various different shades of green. I love how the ‘fancier’ gold patina chargers and flatware are juxtapositioned on an old white-washed table! Using the three colors of pink, green, and clear old-fashioned pressed glass is brilliant. 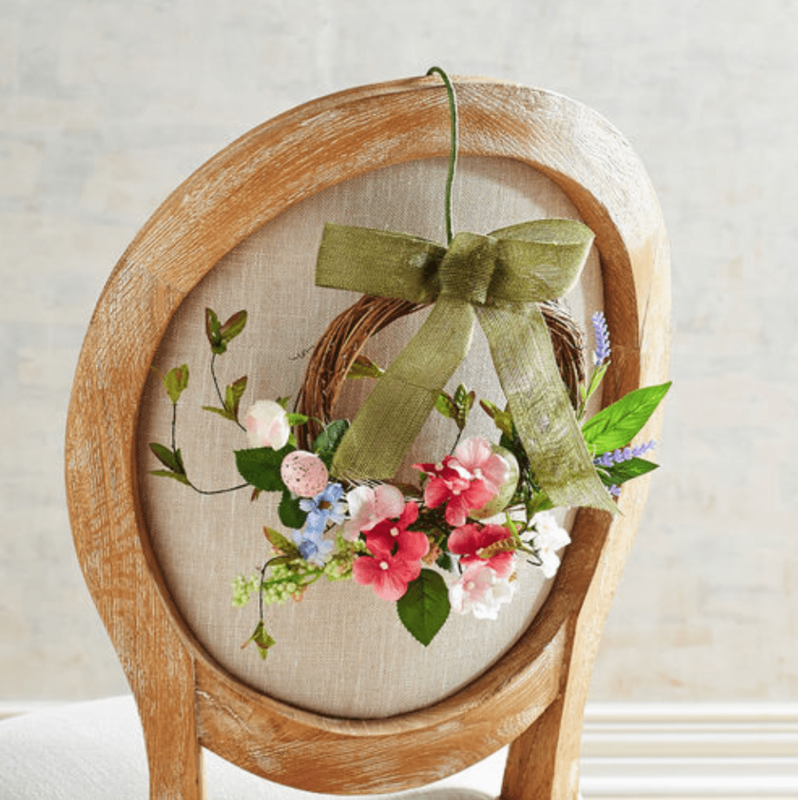 These chair wreaths would be easy and relatively inexpensive to make! I love lavender and white, these lovely pansies are perfect to use in spring decor, along with the soft pastel colored eggs and linens. This would be pretty by a bedside or even in a powder room. All yellow, such a happy color! If you like minimalism then this is your design style! Clean, uncluttered, and very spring! Another floral theme, this time with gorgeous green ‘lettuce/cabbage leaf’ chargers that set on top of crisp green and white toile table linens. The tiny roses accent the old-fashioned ruby glassware and teacups. I love this floral theme because it is outdoors! The leaves and the unstructured floral table swag work wonderful with the greenery in the garden. Tulips just scream that springtime is upon us. The pink and white tulips are perfect for this pink, white and clear table setting. So clean and light! On the more casual side, carrots always add a pop of unexpected orange. Especially for Easter. The little egg baskets on top of simple white plates is perfect for a table set for kids. Carving out a whole cabbage and using it to hold flowers AND water is a great way to have a completely fresh and natural centerpiece! In a tall clear, unetched vase, fill with water, sliced limes, lemons, or cucumbers with fresh flowers to coordinate. The last ‘edible’ food centerpiece is this amazing asparagus wrapped centerpiece! Asparagus is one of the first vegetables to harvest in our gardens and is present on every annual Easter table in my family. I love the lime hydrangeas with the pink sweet peas. Lilacs are one of my favorite flowering bushes. Their aroma is just heavenly and intoxicating to say the least. Just snip off some branches, just as you would with yellow forsythia (yellow bells), and use as a focal point in a room. Again, with white, lavender/lilac just says ‘fresh’! By now, you can tell that I’m crazy for a lot of white in decor. Long before the farmhouse look was cool, my husband and I built our ‘farmhouse’ with whites and surfaces that we purposefully banged up! Looks used, but isn’t. Anyway, above, instead of forsythia (yellow) or lilacs, you can use flowering plum branches. Set in aqua mason jars along with white dinnerware on a whitewashed old table, it’s just a delightful tablescape. Another simple and inexpensive use of bright blue pansies with white linens and of course . . . uncolored eggs! A very natural look. Fresh flowers from bulbs such as daffodils are also a perfect symbol of spring and Easter. 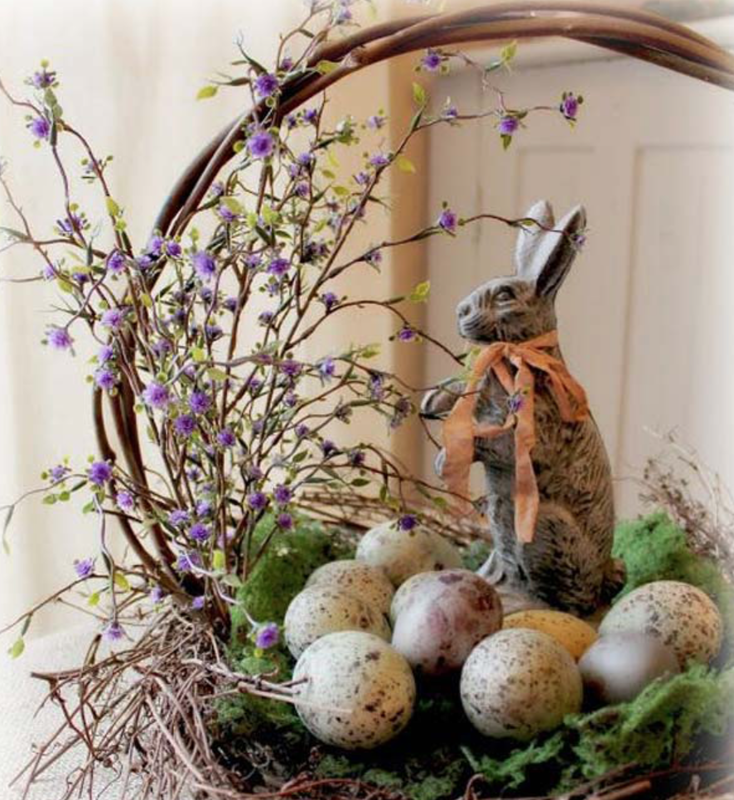 You can find these baskets at any craft store which you can place your spring blooms in along with some eggs. The burlap tablecloth continues to the natural look of this floral theme. I picked this combination theme to transition from ‘floral’ to a ‘bunny’ theme. This may be the opposite of minimalism, however, it has a natural touch to it with the woven twig plate chargers, mossy green egg baskets, green accented plates and napkins, and the foliage of the tulips. With the warm brown walls and gingham draperies, this look is totally pulled together with the bunnies and tulips for the centerpiece. Moving along, let’s take a look at some lovely ‘bunny’ themes! Bright purple hydrangea blooms set next to white ceramic bunnies with soft greens in the ribbons and foliage is an exceptionally vivid centerpiece. The little individual Easter baskets with coordinating centerpiece with the large white ceramic bunny is a more playful, yet bright and fun tablescape. The yellow and white patterned tablecloth work perfectly with all of the white dishes. 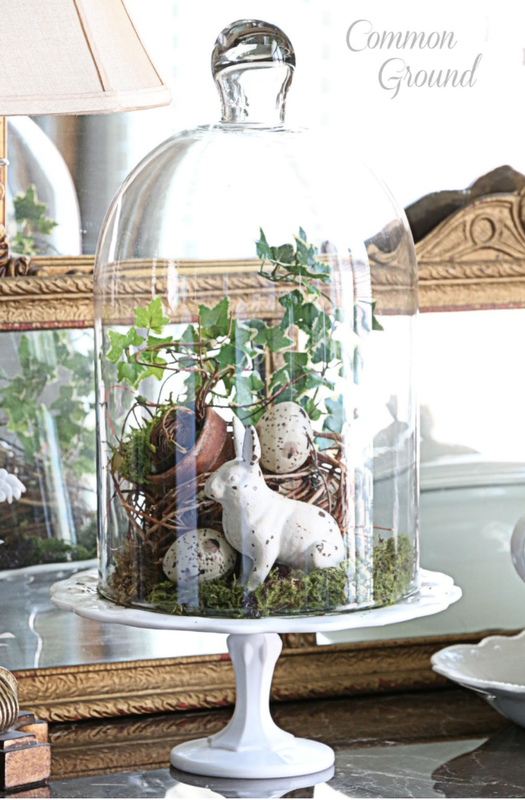 This is such a pretty accent piece to place anywhere in a home for Easter and/or springtime. The little terra cotta pot and all of the natural elements inside the cloche remind us that its time to get out and enjoy the warmer weather. Lime is a color that is more often seen during summer, but these tender white tulips that are yet to open up work beautifully with all of the white ceramics and the soft green eggs in the green bowls. The natural basket really grounds the look. What would Easter be without Easter baskets filled with chocolate eggs and bunnies? This pretty piece can be set on a table in the front hall for guests to see and get in the spirit of the day, or placed on a buffet. Once again lavender/lilac interplays with the natural elements in the basket. And that leads us to the last theme shown in this post for EGGS! You can pick up these apothecary jars at any craft store and they aren’t very expensive. Fill with shredded natural colored paper and place your colored eggs inside for a bright and simple look! Got a lot of eggs? Here’s a new way to display them. I’d refrigerate this until time of use if you do use real eggs in this centerpiece. The sweet pea flowers are hard to come by these days. Aqua isn’t just for the beach! 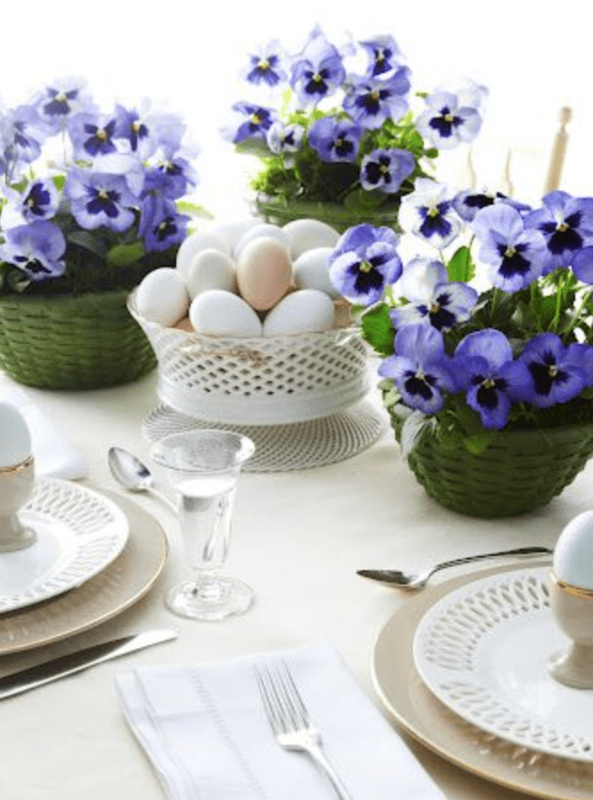 It’s a great color especially to coordinate with (artificial) robin’s eggs, white linens, blue dinnerware, and greenery. 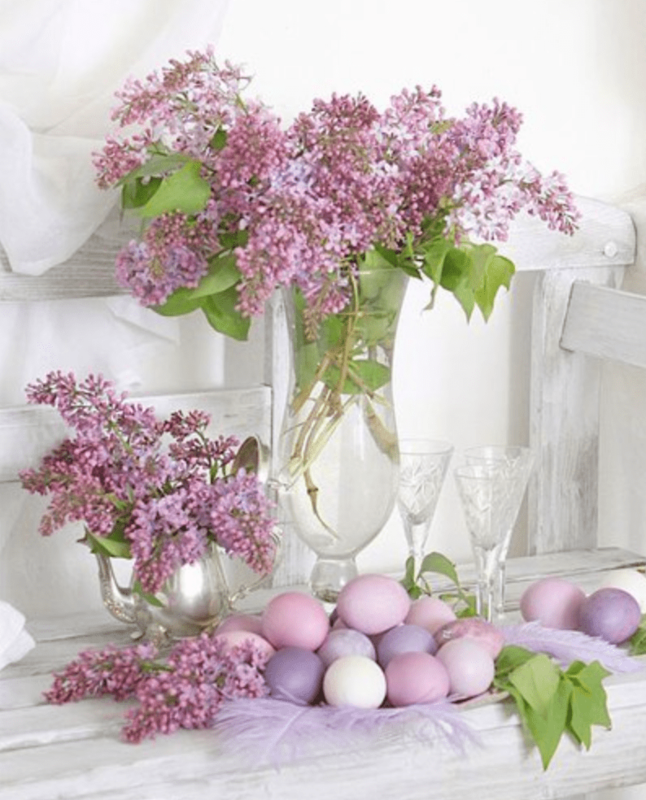 This is an easy and simple egg and baby’s breath centerpiece. Again, artificial pastel eggs can be found in craft stores. Remember those lilac branches shown above? Stay with the pristine white and clear combination and add some absolutely lovely lavender, lilac and purple colored Easter eggs! 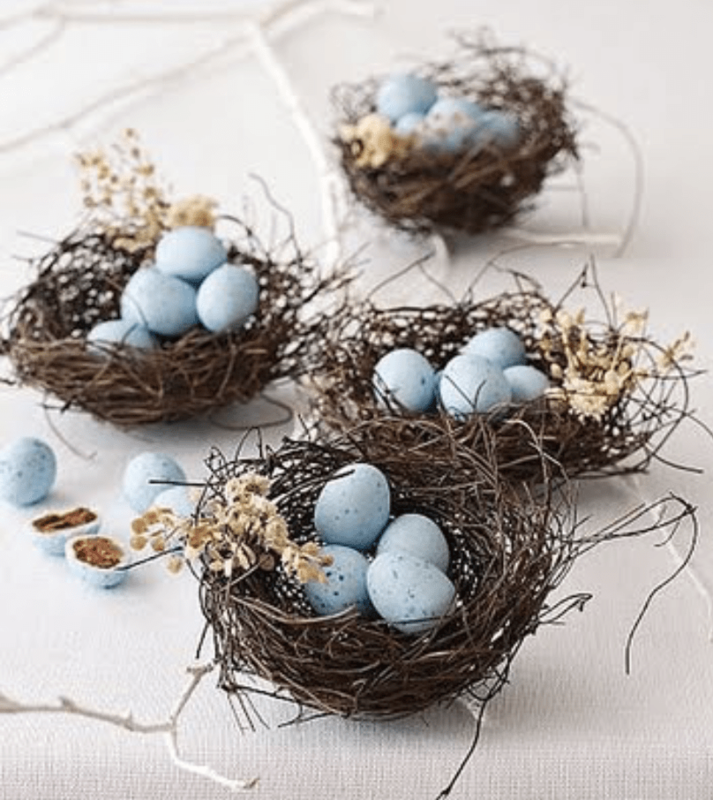 These little blue robins’ eggs are actually chocolate filled. You can find them online. Place them at each individual place setting around the Easter table for a really sweet look and treat too! Another blue egg idea . . . this could be a centerpiece with the little mini baskets above. Eggs of all sizes and construction make up this natural centerpiece. This would look great in a sunroom or on a porch or patio/deck. Lastly, if you’ve got the time, make an Easter egg and moss tree (or two). The spa colors of mint green and aqua in the table runner work so well with the plates and the colors of the tree eggs! Well, my friends, I hope that you were inspired by some fresh new ideas here. Thanks to those who created these tablescapes and shared them on the web. I simply pulled together those that I like. Which of these do you like the best? Or shoot me a photo of one that you DO like and I’ll share it here with everyone! Ah Beth, lilacs are wonderful. I grew up in the Midwest where they grew like crazy. Now, here in the South, it is too hot for them and they just don’t grow well. I love Lily of the Valley too, I need to remember that so thanks for the reminder! Beautiful holiday table set ups! Thank you so much for sharing, Roz. They are all so beautiful. I can’t pick just one! Oh, wow, such gorgeous holiday tables!! I’ve tried the asparagus vase and lemons in the vase, but there are so many more I’d love to attempt! Lovely centerpieces, but the cloche with clay pot and ivy is probably my favorite. I think I may have all the components to recreate it too! But those lilacs are calling my name (sigh) . Thanks for the inspiration. Living in Florida which is warm and tropical, I think I would go for the vase with the lemon slices floating in it.